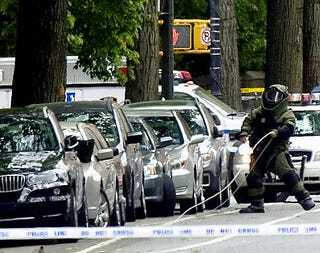 Clueless New Yorkers today mistook a lightly camouflaged BMW X3 prototype — carelessly left running in front of the Museum of Natural History by a BMW executive — for a car bomb and promptly shut down parts of the city. The poor New Yorkers were terrorized by Martin Birkmann, who when not motivating the bomb squad, is the head of BMW North American Motorsports and part of the carmaker's product planning team. Birkmann was driving a very minimally camouflaged prototype of the new BMW X3 to Manhattan's Upper West Side for a quick walk through the park. According to a BMW spokesperson, Birkmann accidentally left the car running when he parked the vehicle near the American Museum of Natural History. If any of us had seen the car we'd have probably taken a few photos of it and maybe tried to sell the car to ourselves for $5,000. Instead, passing New Yorkers, jittery from recent attempts to use SUVs to blow up tourists, called the police. The NYPD promptly shut down Central Park West for a few blocks while the bomb squad took a look at the not-really-all-that-bizarre-looking SUV.